What Is a Prove-Up Hearing in the Divorce Process? It takes two to tango, but sometimes only one to obtain a divorce. When only one spouse files papers in a divorce action, the court may grant a default divorce judgment generally on the terms requested by the filing spouse. Some courts require that party to appear to establish some of the essential facts before entering the final divorce judgment. 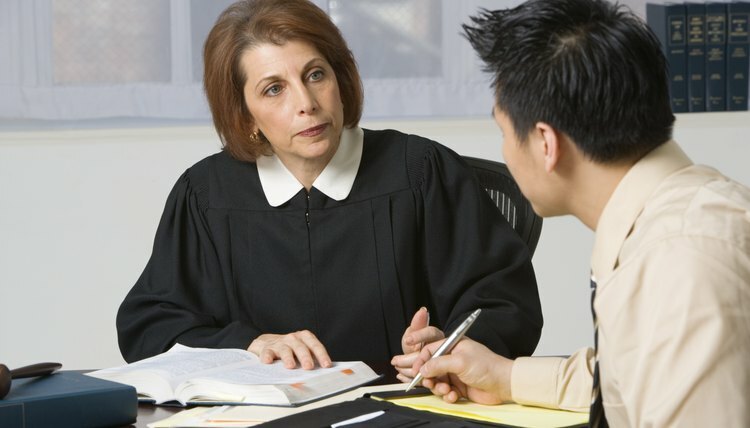 A similar hearing may be required in any uncontested divorce proceeding. This is called a "prove-up" hearing in some states. All default divorces are uncontested divorces, but not all uncontested divorces are defaults. A default divorce decree is awarded when one spouse has divorce papers served on the other as required by law, but the second spouse does not file a response with the court within the statutory period. By failing to appear, that spouse loses his opportunity to contest the divorce petition. A divorce can also be uncontested if the spouses work out the terms of an agreement between themselves and submit it to the court for approval. A divorce proceeding is court litigation; the party filing for divorce must inform her spouse about the proceeding to give him the opportunity to appear and present evidence and legal arguments. If the deadline passes without a response, the litigating spouse must file papers advising the court that the other spouse was served with notice of the divorce according to the laws of the jurisdiction; that he failed to submit a response; and that the deadline has passed. In many states, the filing spouse must also give the court a proposed judgment setting out the terms she is seeking. The court can order a hearing to request documentation of her claims. The prove-up procedure in a default divorce varies among states. Commonly, evidence at the hearing will be recorded by the court reporter, and courts generally require evidence that the other party was properly served and that he is not in the military. Judges also have jurisdiction to ask for proof of any claims the moving spouse has made. In some states, like Texas, the laws specify that the court cannot automatically accept as true the allegations made in the divorce petition even though the respondent failed to answer. In default hearings in those states, the spouse must present evidence to support all claims she raised in the petition. Sometimes judges expect the moving party to establish that basic requirements for a divorce action have been met, such as state residency, jurisdiction and venue requirements. But in other jurisdictions, the default, or prove-up, hearing is very brief -- little more than a rubber-stamp procedure. When the parties negotiate a mutual agreement that resolves such issues as property and debt distribution, child custody or spousal support, they submit the agreement to the court for approval. State procedures vary; different jurisdictions may prefer that the agreement be framed as a settlement agreement, stipulated judgment or agreed final decree of divorce. In any event, the prove-up hearing on an agreement is generally a truncated one. In some states, only one party must show up in court. In others, neither party needs to appear. The judge simply uses the prove-up hearing time to read the documents the spouses signed and filed. On rare occasions when fraud is suspected, a court may require evidence backing up the parties' claims, but generally, the points of proof are limited to the state's standard divorce requirements. The Wright Firm: What Is This Divorce Prove-Up I Keep Hearing About? It takes two to tango, but only one to divorce in California. A spouse properly served with divorce papers cannot prevent the dissolution of the marriage by refusing to respond. In fact, your spouse's failure to file a responsive pleading allows you to file for a judgment based on your papers only, termed a default judgment. You must use the appropriate forms and follow the mandated procedures to request a default divorce.